I love it when a plan comes together AND tastes fantastic – modest opener, no? In the endless round of needing to put a family meal on the table every day, there will obviously be some things that make repeat appearances on a regular basis. In this house, it’s sausages, and much as I love the great quality ones we buy (97% pork), just grilling or cooking them in a pan gets boring – mostly boring for me to make, but also a little dull to eat week in, week out. So here’s a variation that’s just as tasty as sausages, but, more interestingly, in an equally delicious form: Sausage Lasagne! The already seasoned sausage meat goes so well with the robust tomato sauce and flavourful white sauce and – bonus – doesn’t need hours simmering on the stove top. I already had a batch of the tomato sauce in the freezer and lasagne sheets in the cupboard, and so only needed to whip up some white sauce to bring it all together. 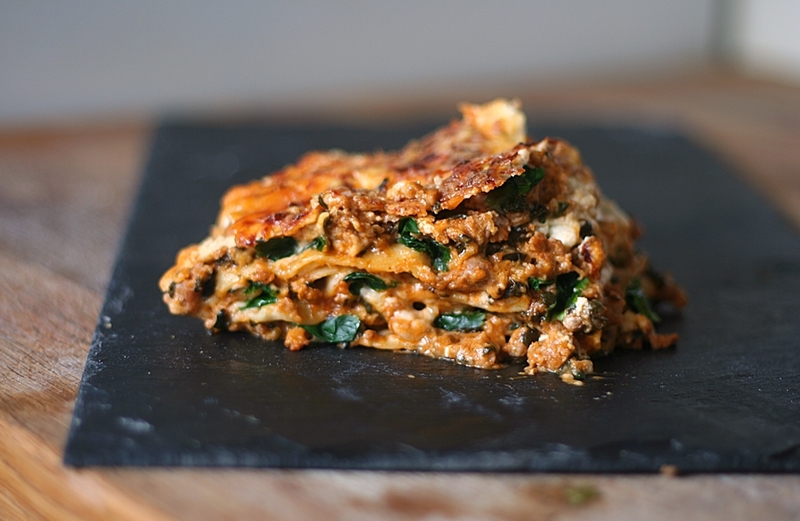 You can assemble the lasagne the day/night before and leave it overnight for the flavours to develop, or make it and bake it all in one go – after just one hour in the oven, it’s ready. I’ve added some healthy spinach to this recipe for a splash of eye-catching green, and the strong flavours of the sauces mean that the spinach can be easily passed off as parsley to suspicious family members. *pokerface* Not that I’d ever do that. To speed things up, use your own white sauce and/or tomato sauce. I’m going to run through the recipes I used for both, purely as suggestions. The tomato sauce does freeze very well, and is then handy for rustling something up at short notice. Important: The quantities given make a LARGE lasagne – probably enough to feed eight – quite deliberately. I highly recommend making it as is, because a) it’s really worth the effort and b) it freezes/reheats extremely well, so the remains can be frozen in individual portions for a speedy supper at short notice. If you’re cooking for yourself and/or have a small amount of freezer space, then you might want to make a half quantity and reduce the cooking time to between 30-40 minutes. The spices are optional, but they do give a more rounded flavour than just a plain milk/roux sauce. Stick the cloves into the onion, just below the middle, so that they sit under the surface of the milk when the onion floats. Put the milk, onion and the rest of the flavourings into a small pan and heat slowly. When the mixture is almost at a boil, remove from the heat, cover and set aside to infuse until cool. Strain the flavourings out of the cooled milk. Clean the pan and return to the stove top. Melt the butter in the pan and stir in the flour to form a paste. Gradually add the milk a little at a time, stirring it smooth each time. When all the milk has been added, turn the heat to low and let it simmer for five minutes to ‘cook out’ the flour. If you don’t do this, your sauce will taste ‘floury’. Once the sauce has simmered enough, season to taste with salt and pepper. Cover the sauce with cling film until required. Make sure the cling film touches the surface of the sauce to prevent a skin forming. This probably doesn’t qualify as a traditional tomato sauce, but it has a great, rich flavour that goes well with the cooked sausage and has a bonus of loads of flavoursome veggies hidden inside. This will make more sauce than you will need for the lasagne, so freeze the extra. Put the onion, carrots and celery into the bowl of a food processor and blitz until finely chopped. Heat the oil in a large pan over medium heat, and add the chopped vegetables. Stir over medium heat until the moisture in them has evaporated. Hint: If there’s clouds of steam rising from the pan, there’s still moisture. Stir regularly. When all the moisture has evaporated, add the tomato paste and stir. Continue stirring until the tomato paste has caramelised. It will turn from a dark red to more of a brick-coloured, orangey red. Add the rest of the herbs and the chopped tomatoes and simmer over a low heat for an hour, stirring occasionally. If you have a splash guard, you might want to cover the pan to protect your stove top, but you don’t want to cover it closely – the evaporation will intensify the flavours. Remove the bay leaves (or not, your choice – sometimes I forget them and they get blitzed along with the rest of the ingredients – it’s not the end of the world) and puree the sauce smooth with a stick blender or by using a blender attachment on your food processor. Return the pureed sauce to the pan and season with salt and pepper to taste. Remove the sausage meat from the skins and add to a large pan. Stir over medium-high heat, breaking up the larger pieces of meat with a wooden soon, until it is just cooked through. Add the tomato sauce and bring to a simmer. Remove from the heat and stir through the spinach – the heat of the sauce will wilt the spinach and it will keep a lot of its glorious colour. Select a large dish to construct your lasagne. Spread a thin layer of the sausage sauce in the bottom of the dish. Add a layer of lasagne sheets over the top. Feel free to break the sheets up in order to make them fit. Add a layer of meat sauce, then a layer of white sauce. Continue layering until all the components have been used up. Bake for 1 hour, until cooked through and bubbling. When the lasagne has cooled to room temperature, cut it into portion-sized pieces – as it cools, it will firm-up nicely, so the pieces should stay intact rather well. Put each piece in a ziplock bag, box or wrap in cling film and freeze. Once defrosted, put the piece or pieces into a dish, cover with foil and put into a cold oven. Turn the oven to 180°C, 160°C Fan for 20-30 minutes until heated through. You may like to sprinkle a little extra cheese on the top to freshen it up. If, after this time, you’re not sure that it’s hot enough, a quick zap in a microwave (be sure to swap the foil for cling film) for a minute or two should do the trick. Use a stainless steel saucepan or an enamelled cast iron pan. I’m of the opinion that the acidity in tomatoes has ruined my non-stick pans in the past, and so I’ve now banned myself from putting tomatoes into any of my non-stick pans. I use Sainsbury’s ultimate 97% pork sausages. Or greenery of your preference. Blanched kale is terribly good for you – bit more difficult to pass off as parsley, though. I’m so enchanted with this recipe – so simple, so refreshing, so vegan. Yes, that’s not a typo. Completely lacking in animal-derived ingredients. “But it looks so creamy!” I know, right!? I usually mix equal parts mayonnaise and plain yoghurt to get creamy with a little tang – but this mayonnaise delivers on both counts. It’s not overtly apple-y, but you can taste the freshness. It’s fabulous! Apples: If Bramley apples aren’t available to you, use three (3) sharp apples such as Jazz, Braeburn, Granny Smith. Also, make sure there’s no excess moisture left in the pan when the apples are cooked. The resulting mayonnaise will be slightly less firm, but certainly not runny. Acid: I’ve switched the original vinegar for lemon juice. Experiment. A nice white balsamic might suit the apples you have perfectly. Mustard: I’ve used yellow mustard powder, but if you like things feisty and have the seeds, grind yourself some black. Alternatively, use ready mixed mustard – a mustard mixed with vinegar might prove the better compliment to your apple pulp. Sugar/Salt: Both are needed, maybe you’ll need a little more of one that the other again, depending on your apples. I stayed with ordinary table salt and white, caster sugar, as I wanted the colour to remain light and creamy, but there’s certainly scope for using the whole range of sugars from icing through to molasses. Smoked salt is the next variation I’m planning to try. Have at it! Pepper – again, thinking of the impact on the finished colour, I opted ground white, but an earlier version contained coarse-ground black made for a lovely speckled effect. There’s also all the ‘red’ peppers (paprika, cayenne, chilli etc) to introduce a little (or a lot of!) heat. Oil: Originally vegetable, I also tried various mixtures as well as a couple of less obvious options. Vegetable is fine, but I felt it a little ‘claggy’ on the palate. Switching out 2tbs for olive oil wasn’t an improvement. However, in it’s defense, I must confess I didn’t use the best quality olive oil. Grape seed oil I found gave richness without clagginess. Experiment! Core, peel and chop the apples and put into a small pan with the lemon juice, sugar and salr. Cover and simmer over a low heat until cooked and fluffy – this won’t take long at all, so don’t wander off and let it burn. If you’re using a sharp dessert apple, they’ll need a little longer to soften, plus you’ll probably need to leave the lid off once cooked just to let the excess liquid evaporate. Use a stick blender to puree the apples smooth. Add the mustard and pepper and blend in. SLOWLY – and I mean one drop at a time to begin with – add the oil. Just as with traditional mayonnaise, if you add the oil too quickly, it won’t emulsify and you’ll end up with runny mayo. Once you’ve added half, you can start to add a little more at a time – maybe a teaspoon – but certainly don’t just slosh it all in. 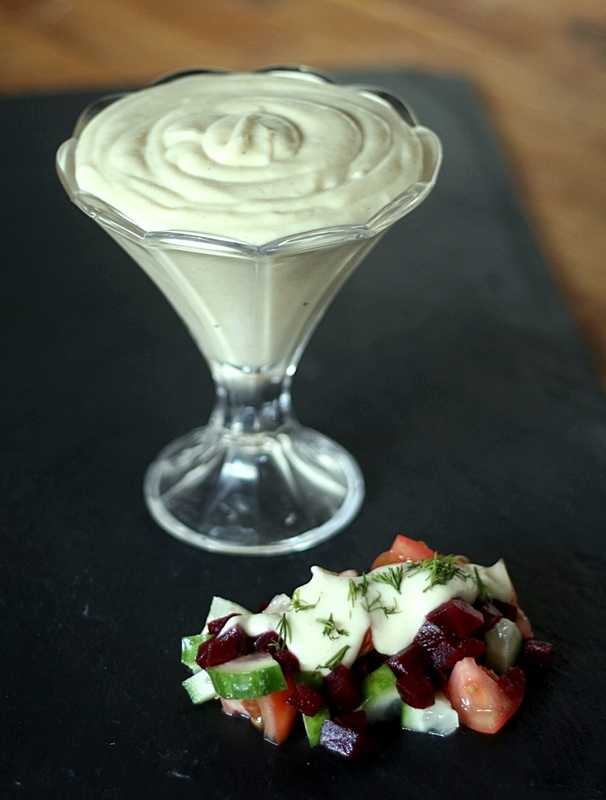 Transfer the finished mayonnaise to a plastic container and chill thoroughly. It will keep up to two weeks in the fridge. … and Phew, what a scorcher! Having given house room for the past 2 years to the five bags of charcoal we optimistically bought in preparation for the barbecue summer of 2009 – you know, the one with the torrential rain – I am allowing myself to use the above time-honoured tabloid headline phrase whenever the thermometer threatens to creep above 20°C. So seeing as it’s shaping up to be a fine weekend, I’m thinking it’s going to be a great time to fire up the barbecue and use some of our charcoal stockpile. In the UK, the term barbecue tends to refer to the object you use to cook outside, and therefore anything cooked on this item is deemed barbecue food. In the US, this style of cooking is referred to as grilling, and barbecue actually refers to something closer in style to slow-roasting. Whichever approach you favour, a good sauce is a necessity to slather over the hot food of choice – and so here is my own recipe for just such occasions. 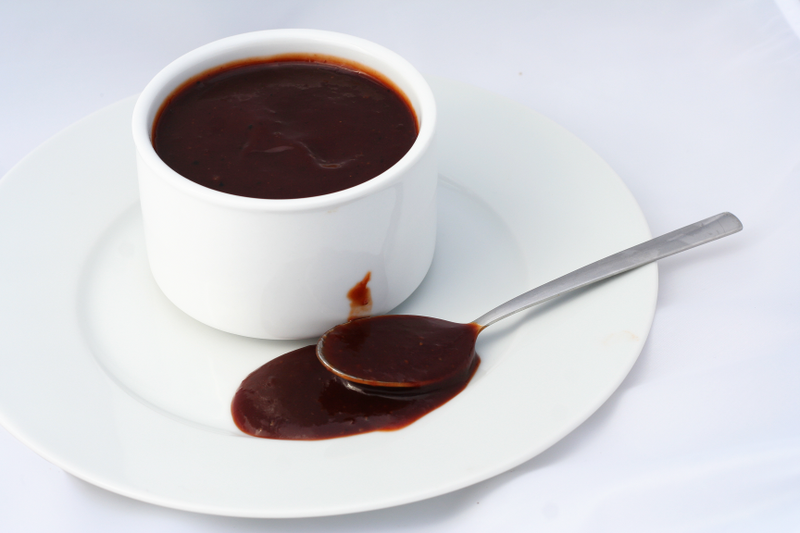 I really love this sauce – not just because of the tangy, smoky flavour (which is AWESOME by the way) – but also its beautiful colour – rich, dark and delicious – and the fact that it’s so simple to make. The use of the sweet, smoked paprika lends a wonderful smoky taste without having to resort to artificial flavourings, and also means its child-friendly in its mildness. Nevertheless, if you like heat in your sauces, use the hot smoked paprika with impunity! Heat the oil over medium heat; add onion and cook gently for about 5 minutes, then add in garlic and continue to cook for 2-3 minutes. Add paprika, salt and pepper and stir for 1 minute. Add all remaining ingredients and stir gently to combine. Simmer uncovered until the sauce thickens. You may need to use a splatter guard as the sauce thickens and bubbles. Whizz in a blender if you prefer a smooth consistency. This makes about 700ml of thick sauce. If you prefer a thinner sauce, add water to desired consistency. I keep this in my fridge, in the washed and rinsed ketchup bottle used to make it. To keep costs down, buy basic, no-frills ketchup – I found a 560ml bottle for 22p!